The plaza, which runs from the back of the museum to Tarragona Street, was built with funding from several area organizations and donors. One of the standout features of the plaza is the Linda Evans Memorial Education Pavilion, named after a distinguished UWF alum. "(Evans earned her bachelor’s degree in elementary education, and was part of UWF's first graduating class in 1969," said Reddy. "She devoted 35 years to teaching students at the Royal Green Elementary School in Miami." The plaza also features an interactive early learning playground called Discovery Square, which was the winning entry in a competition to come up with a name for the space. 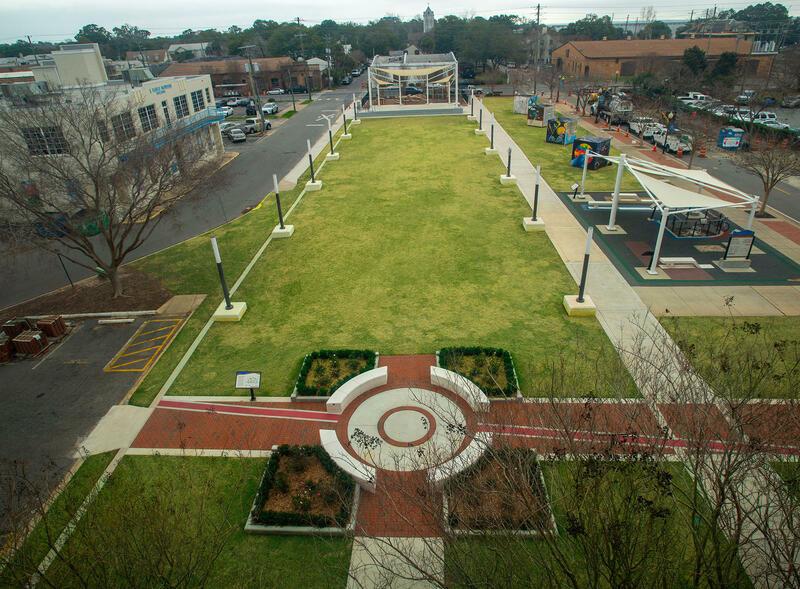 The hope is that the square will be another attraction to bring people to downtown Pensacola. Collier Merrill is the Chair of the UWF Historic Trust. He says that while downtown has become a destination for out of town visitors, it wasn't always that way. "Twenty years ago when I started working downtown and you'd walk around down here and if you saw a tourist, you'd literally take a picture of them. It's about people out visiting and walking around. Cultural tourism is alive and well in Pensacola." In addition to the pavilion and playground, the plaza features the Rose Garden Storytelling Circle, several historic markers and exhibits. There are also plans to install additional benches and a bike rack. It is all part of a years-long master plan to expand and build off of Pensacola’s long history. "The crowning jewel of that project (is) this plaza. It was a parking lot. And I got a lot of flak for taking away parking cause that's a hot topic!" said Rob Overton is the Executive Director of the Historic Trust and the Chairman of the Board of Visit Pensacola. "In 2011, Palafox Street was named one of the top 10 streets in America. We need to transfer some of that energy to the rest of the community. This was a dead zone back here. It was a disconnect with the T. T. Wentworth Museum and now the art museum and the children’s museum and the rest of the Historic Village down here. So we took this important archeological site and decided we could do better with it." Overton says future plans for the historic section of downtown include new 3-D printing technology in the Museum of Commerce plus new signage to help visitors navigate the area.